Our indicative furnace has proven popular for many years, providing customers with real insight into their own products’ performance. 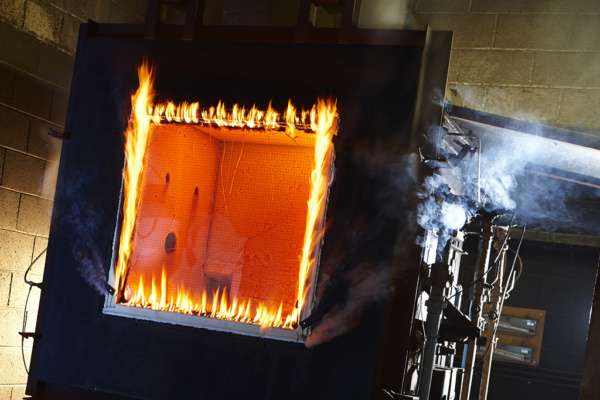 Prior to full scale testing our customers can use the furnace for product development purposes – helping to save substantial testing costs. Using our furnace, the fire resistance properties of building materials can be tested in accordance with BS 476-20 (method of test for determination of the fire resistance of elements of construction) or EN 1363-1 (fire resistance test standard); or be client specific to suit a particular purpose. The furnace pressure can be adjusted to test either the top or bottom of the door. The maximum overall specimen size of the indicative fire test furnace is 1m x 1m.